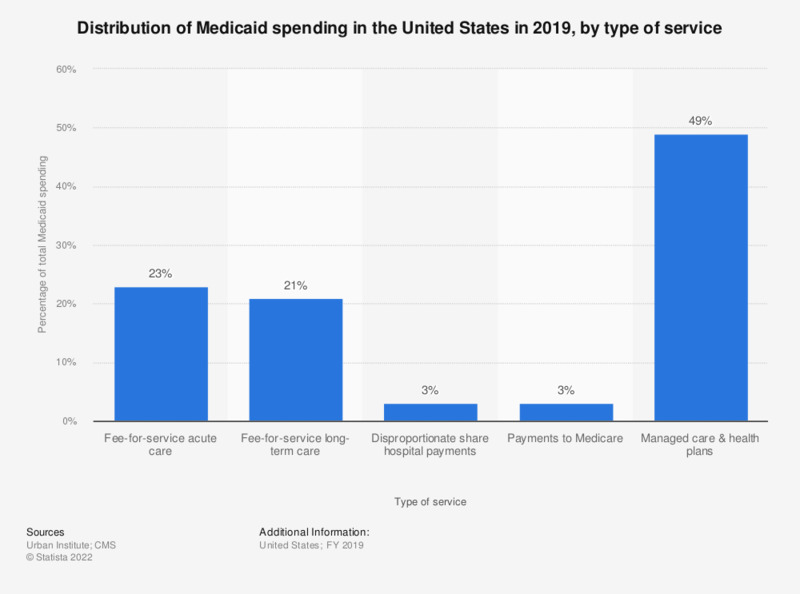 This statistic represents the distribution of Medicaid spending in the United States, sorted by type of service, in federal fiscal year 2017. In that year, approximately 24.6 percent of total national Medicaid spending was due to fee-for-service acute care. Medicaid expenditures do not include administrative costs, accounting adjustments, or the U.S. Territories. Total Medicaid spending including these additional items $576.6 billion in FY 2017. Federal Fiscal Year runs from October 1 through September 30. FY 2015 refers to the period from October 1, 2014 through September 30, 2015. Acute care services include payments inpatient, physician, lab, X-ray, outpatient, clinic, prescription drugs, family planning, dental, vision, other practitioners' care. Payments to Medicare are primarily premiums paid by Medicaid for Medicare enrollees. Medicaid may also pay Medicare cost-sharing for some individuals, but these amounts typically should be reported as payments for other services (e.g., "Inpatient Hospital"). Managed Care & Health Plans includes payments to health maintenance organizations (HMOs), prepaid health plans (PHPs), and other health plans, as well as primary care case management (PCCM) fees.